Sac. dagger specifically adds a power dice, thus it cannot go above the limit. Furthermore it can only be used for +1, you can't chain several bonus dice (this is very explicitly stated in its description). Power of darkness and anything. You could probably get away with taking nothing but core and magic and come out on top. s10 asf on everything? And I still have 5-8 dice to play with? Yes please. Spamming spells isn't really a strong strategy. You're hoping and praying that you roll enough on your D6 to get it off. If it's a 1 you very well could fail by rolling a 1 or 2. You're also banking that you roll high enough for your opponent not to dispel it. You're also putting your wizard at risk. There are plenty of things in the game that can kill him while you destroy the unit. It's decent when you need it, but I'd be much more interested in trying to get a variety of spells off than fixating on one spell. Pretty strong with a Lvl 4 High Archmage with Book of Hoeth. The D6 roll for power dice doesn't matter much when your one-dicing spams of Soul Quench, Drain Magic, Apotheosis or Hand of Glory. You are almost certainly going to make 3+ with a re-roll, so your opponent has a choice of either letting them through in bunches, or letting you gradually whittle down all his dispel dice (he will probably need to two-dice most dispel attempts) and give you a free reign in the latter part of the magic phase. Has anyone considered monsters? I don't remember the rules of beast master, but was it just granting monsters +1A? Running those with pheonixs and hydras would seem fun, doubt the viability competitively though. I'm slightly addicted to large monsters right now. Check out my High Elves R3K Plog! It's super picture heavy though... You've been warned..
His main disadvantage is that he has to be bought mounted on a scroungerunner or on a manticore, AFAIR. Neither are specially good, and both are very vulnerable to cannonfire. Yeah. They're 300 points naked, and while you do get a free Manticore or Scourgerunner they're not exactly the most sturdy of mounts. He does give the monster D3 extra attacks though. Still not worth it in my opinion. 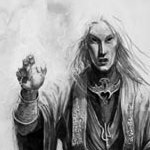 What about the viability of running witch elf core, deathhag with white lions, and sword master as chaff. Arch age with light magic to secure leadership tests on frenzy and time warp for additional buffs towards, attacks, asf, and charge distance. Lionstar with botwd as primary block. Everything gets 2A and should be pretty threatening to most things, since you've got asf, poison, and str 5-6 hits. I just tested in a game against undead the combination of Lvl 4 with High Magic + Book of Hoeth + magic of the ET: Khaine. It's OP as hell. The unit had a constant 3++ ward save, and the enemy chaff didn't last longer than a turn. Furthermore, I could move around to threaten the enemy -rear- in the first turn by chaining WBW. Seriously, that combination is hell for the enemy, and drain magic is absolutely brutal under this magic phase. That, and Deadlock. No Invocation for you... ever. Problem is that ET is even more aggressive than normal WHFB. Nagash summoning all kind of nasties from behind your enemy lines, Karl Franz swooping over your less protected units, Nurgle beasts side by side with Skullcrushers... Everything is hard, fast and hits like a ton of bricks. In these circumstances, infantry can work, but it requires a ton of work. As a side note, another thing I've realized about this magic phase is that magic resistance of some kind is mandatory for your characters. With the way spells can be spammed, a level 4 can end with any unprotected or lightly protected character in a single turn. Sadly, the BotWD is more important than ever under these rules. I'm surprised there hasn't been any discussion about Allarielle Incarnate of life, AoE regen is pretty potent, combined with healing a wound to every model in 12", combined again with Star of Averlorn. Is this finally the way to make our Infantry based lists competitve? Are Glade Guards the better option for ranged infantry? HE Archers are cheaper and DE Darkshards can use shields to survive a bit more, but Glade Guards seem to be more versatile. Should I just take a unit of 15 instead of my regular unit of 15 Archers in an Eternity King list? I think Glade Guard are superior to High Elf archers no matter how you compare them. Darkshards -may- have an advantage in certain setups but I doubt that: Glade Guard are extremely potent at what they do. Healing single models does not help infantry lists. Besides in the ET context, things just go crazy. Alarielle is not crazy. Our infantry are not crazy. Ironically she'd go very well alongside Tyrion. Failing that, it's hard to get proper mileage out of her unless you go really big (like, being able to take her + Malekith big and even then I don't know if that's how best to invest your points). I was thinking more along the lines of Treekin, and infantry as support constructs, but quickly ran out of points when trying to write a list with special infantry. Her healing helped me critically keep great eagles alive, and kept my bsb with just a 1+ on foot safe and sound, Without the benefit of strength increasing magic (mindrazor) even with regen the core infantry weren't doing enough besides not dying. But it is the closest I've come to a viable Spearmen based list if that is something people are looking to try. I backed the Queen up with a level 2 WE shadow caster, with a power stone or a power scroll depending on points. The points indeed evaporate very quickly once you start loading up on elites. Treekin just don't have any punch. The same for Treemen, relative to the points cost. I think Alarielle works best in a deathstar-approach with a Light Coven, which is basically the same as it ever was. AoE regen allows for some pretty effective defensive builds and her heals can either be used with Phoenixes, characters (in a deathstar or peg-masters) or mounts such as Cauldron of Blood/Dragons. The problem is that she is expensive and the points quickly evaporate. I think I'd like Witchelves core with her and WL special backed up by massed RBTs and a Light Coven. WE with Razor and WL with BOTWD, both covered by regen, is pretty effective defensively. MSU WE core could probably also work (might even be better).